take the scallions, wash them well and chop them. chop the garlic too. leave the green of the scallions for garnishing. wash the mushrooms very well and chop them. wash the spinach leaves and chop them. wash the basil leaves and keep aside to be chopped later. in a pan heat up the olive oil and add the chopped scallions and garlic and saute for 3 minutes on a medium flame. mix the mushrooms with the onion and garlic and saute it. first the mushrooms will start to leave water. then the water will start becoming less. then you add the chopped spinach leaves when all the water dries up. saute for a 3-4 minutes till the spinach becomes soft. add salt and pepper and saute the veggies more for 3-4 minutes till the spinach is cooked. add the chopped basil leaves. lower the flame and pour the cream. at this stage you could also add cream cheese. i did not add any cheese to this recipe. mix the cream well with the veggies. 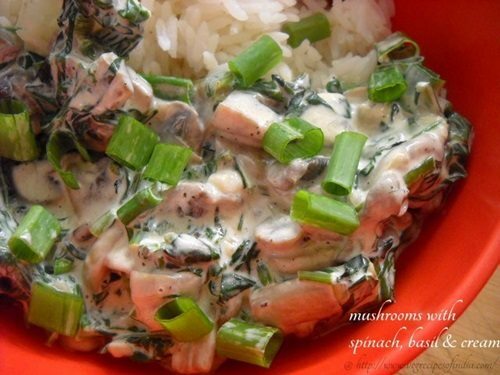 switch off the burner…..garnish the creamy mushroom spinach with the scallion greens. and if you like some parmesan cheese… and your mushroom spinach cream sauce is ready to be served with your choice of pasta or noodles.